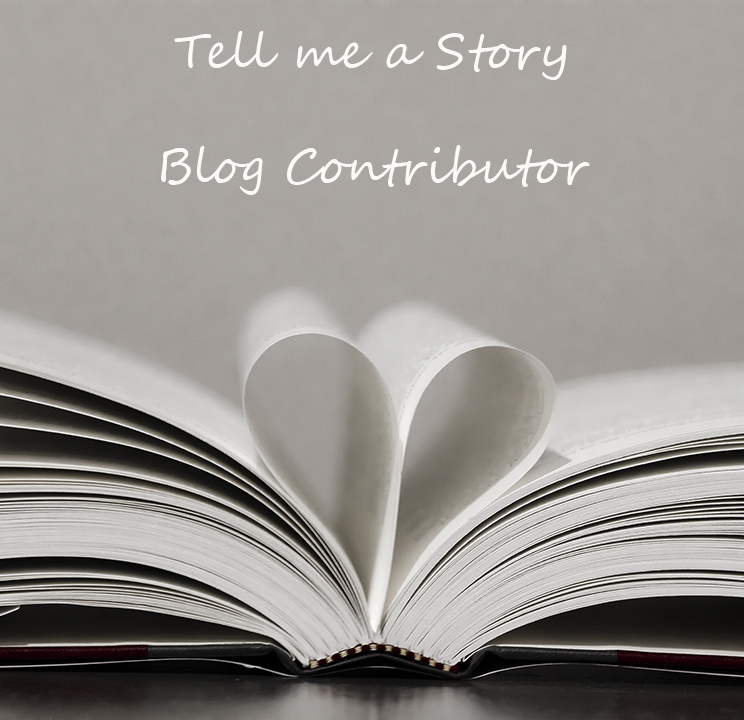 The images are not perfect but I could not resist telling this story. 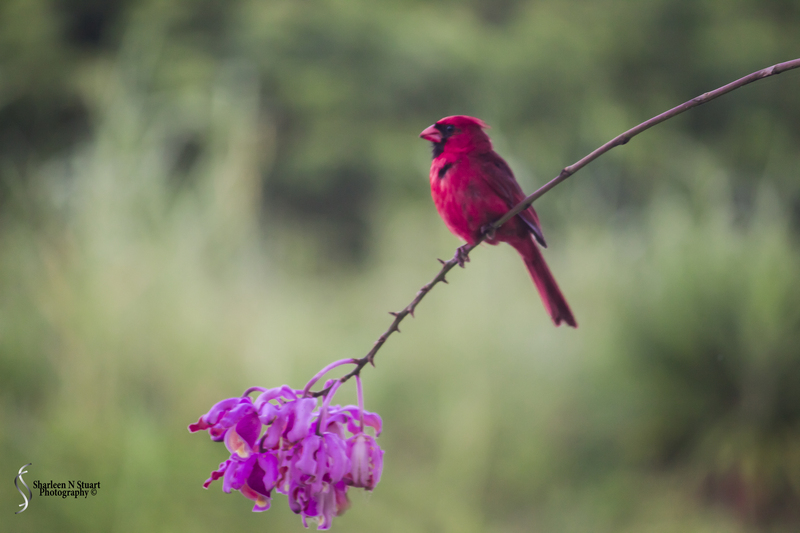 You have probably seen me posting this little red Cardinal on my photography page in Facebook. It is a beautiful bird and as a nature lover I love seeing new and interesting birds in my back garden. However, this bird is driving us nuts. Our windows have a reflective shield since the summers in Florida can get really hot. 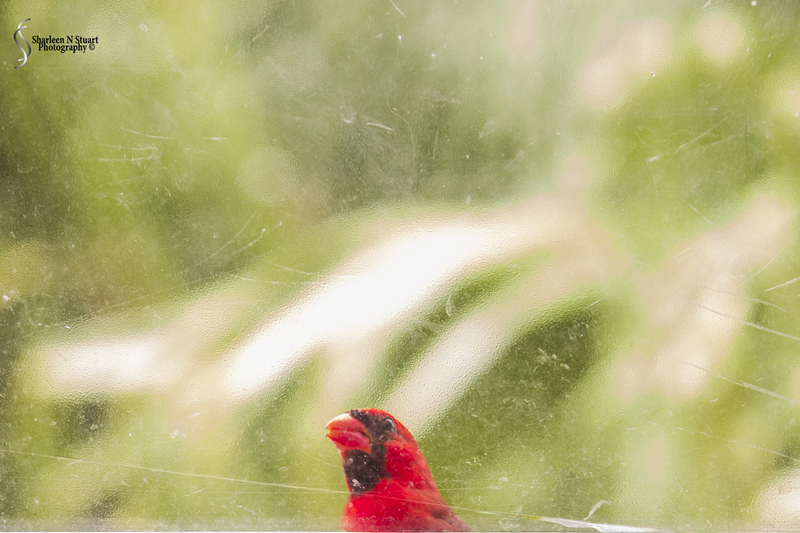 It appears that this little Cardinal probably can see trees and reflections in the window. Since it is spring and mating season, it is probably looking for a mate. Unfortunately the one in the reflection is not responding. It keeps flying at the window, sitting on the edge and pooping on the deck. So yesterday Richard cleared the deck, pressure cleaned it and then painted it. Prior to doing that he hung old curtains over the window to stop the bird from checking out it’s reflected mate. I was working in my study and suddenly Moonshine, my inherited cat, and such a sweet one at that, took off from my desk, growling as only cats can growl. 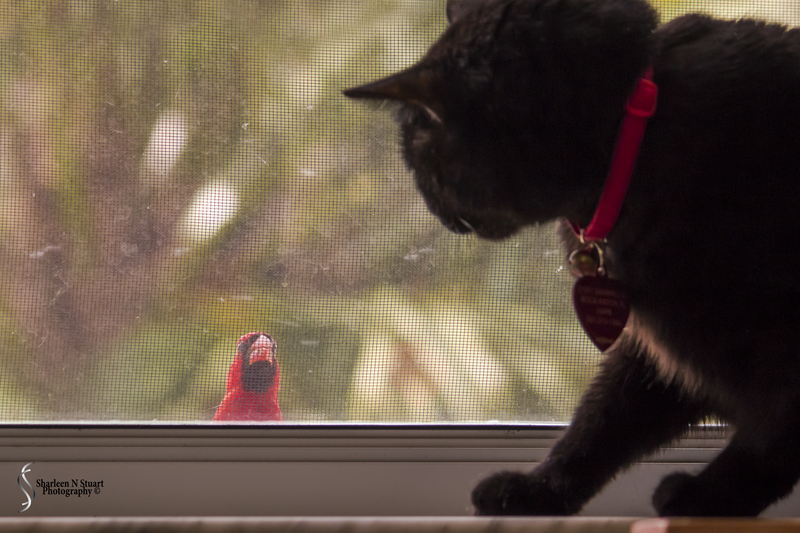 Apparently the Cardinal found another window and another mate. Only this time there is a furry monster in the picture. 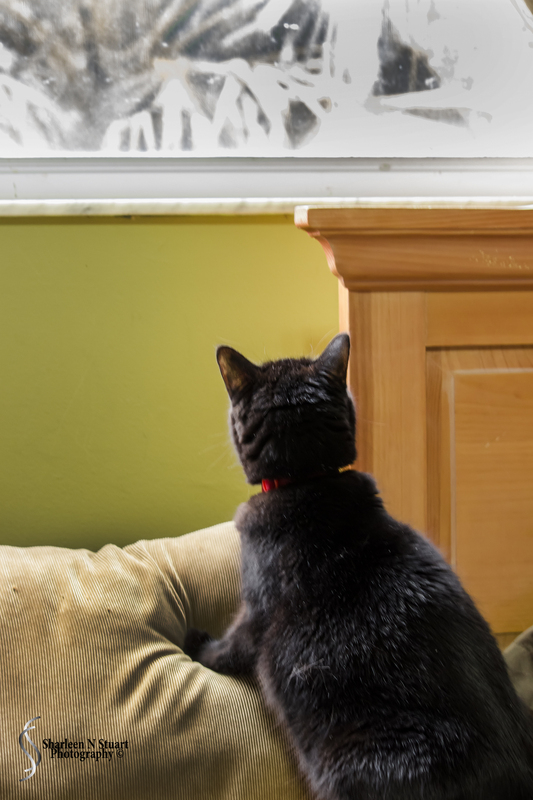 So the Cardinal flies up to the window and peaks and sings, and Moonshine spends half her time falling off the window sill trying to catch the cardinal. The glass looks terribly dirty close up, but the reflector is scratched and worn from over 15 years of being attached to the window. Added to that I am not climbing out on a double story roof to clean them. 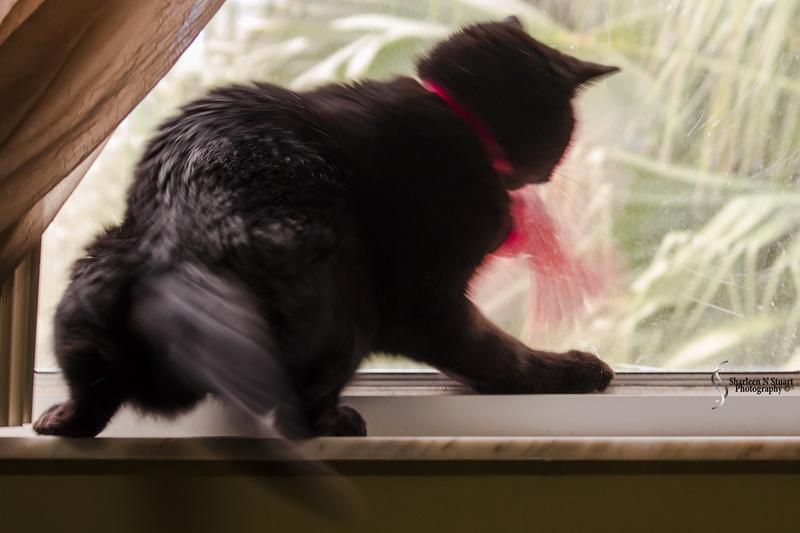 Moonshine was all action, trying desperately to catch the bird, and ended up very frustrated when she could not. 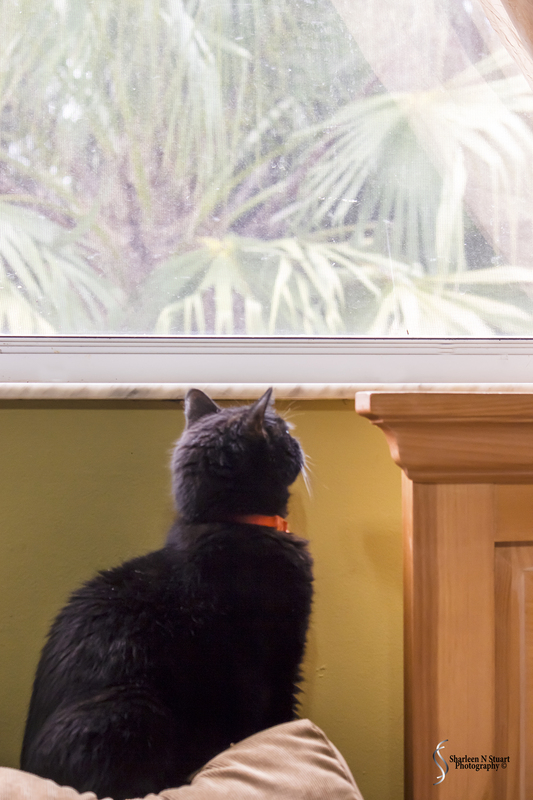 For the entire afternoon she either stared at the windowsill or climbed up to find the bird. Where is that Cardinal? It is out there somewhere. She just kept waiting. 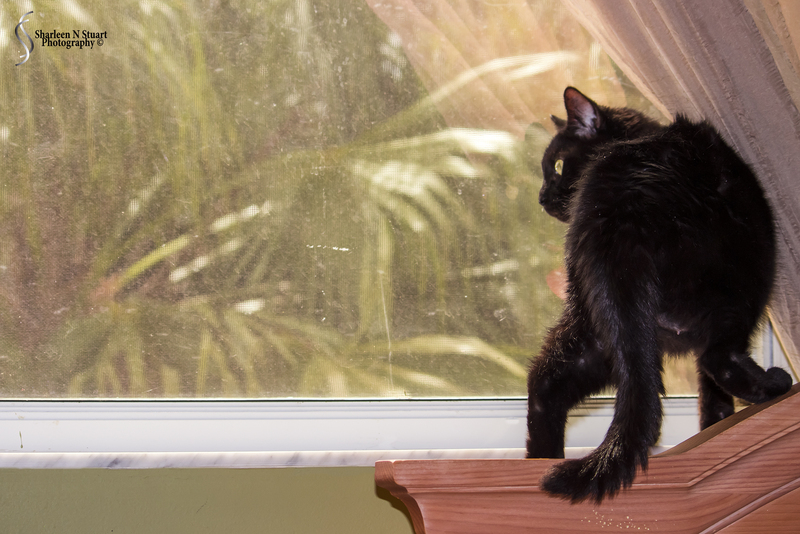 And then she would stretch up to the ledge and peer out through the window. Waiting….for the right opportunity to spring up and catch it. Finally they were face to face and she was growling her funny noises again. 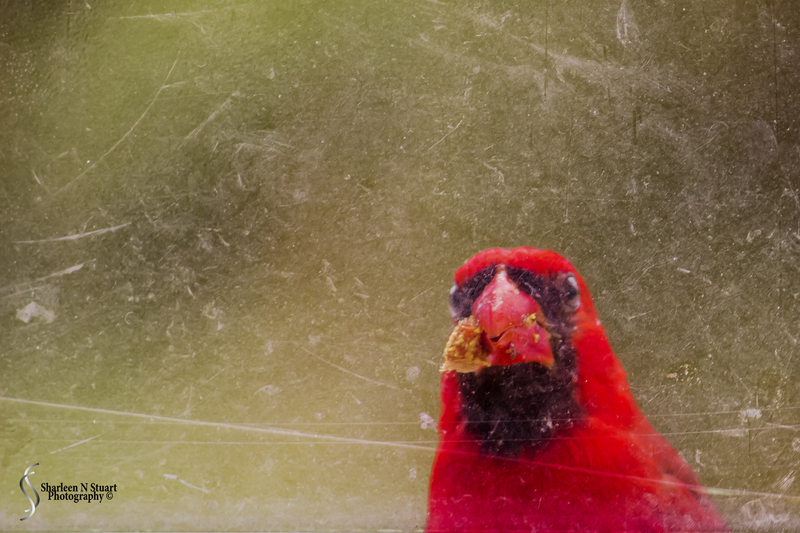 The bird on the other hand was happily pecking away at the window. and chewing on a berry of some sort. We also have mosquito netting for the months when summer is done and the cool air is flowing through. 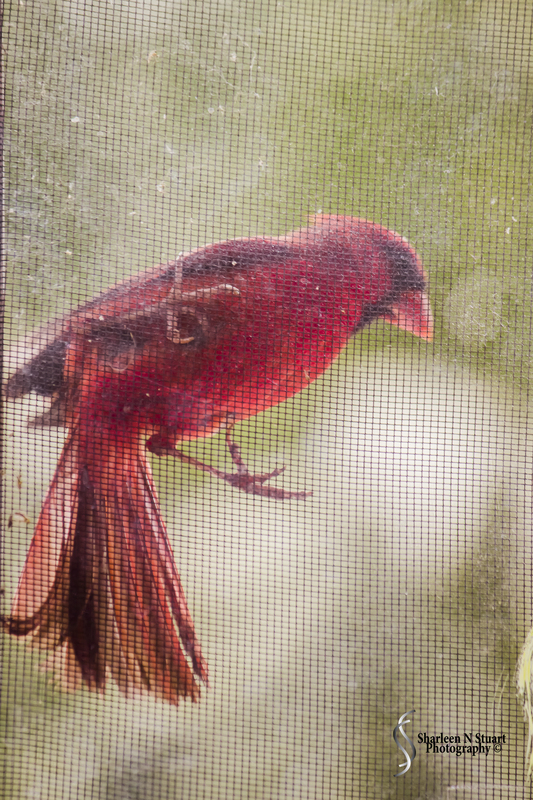 Mosquito’s are a hazard of life in our neck of the woods, but the netting is a great landing spot for the Cardinal. I’m hanging out – catch me if you can! And my poor little girl, keeps attempting. This has gone on all weekend. 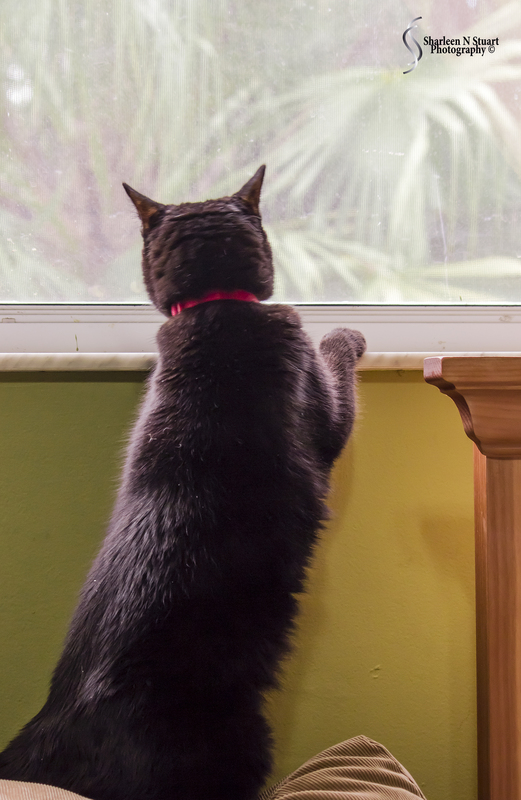 Richard seems to think that the bird will disappear but all it is doing is going to the second story. I can sense the frustration of my poor cat. 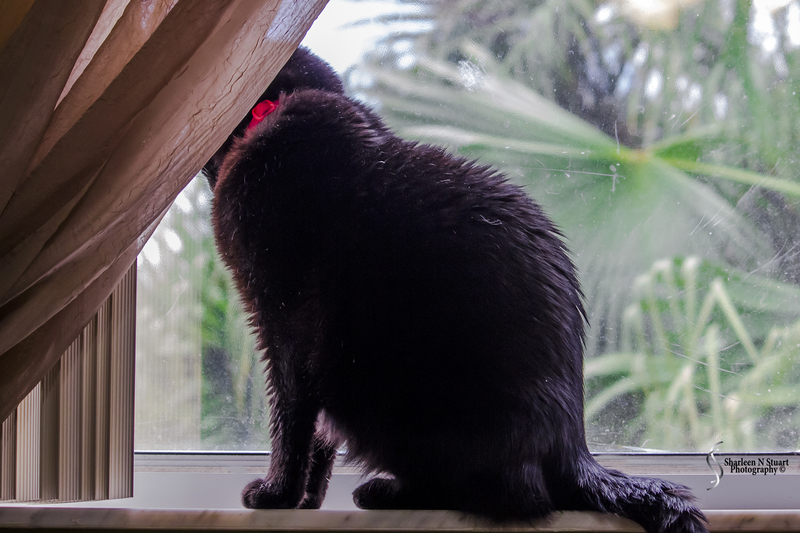 Moonshine is going to go nuts if that bird is pecking on the office window all day. In the interim hopefully it finds it’s mate and goes and makes more little Cardinals. Not sure why it is so instinctive for a cat to want to catch birds. While not the artistically perfect photo’s, this was great to watch over the course of this weekend. 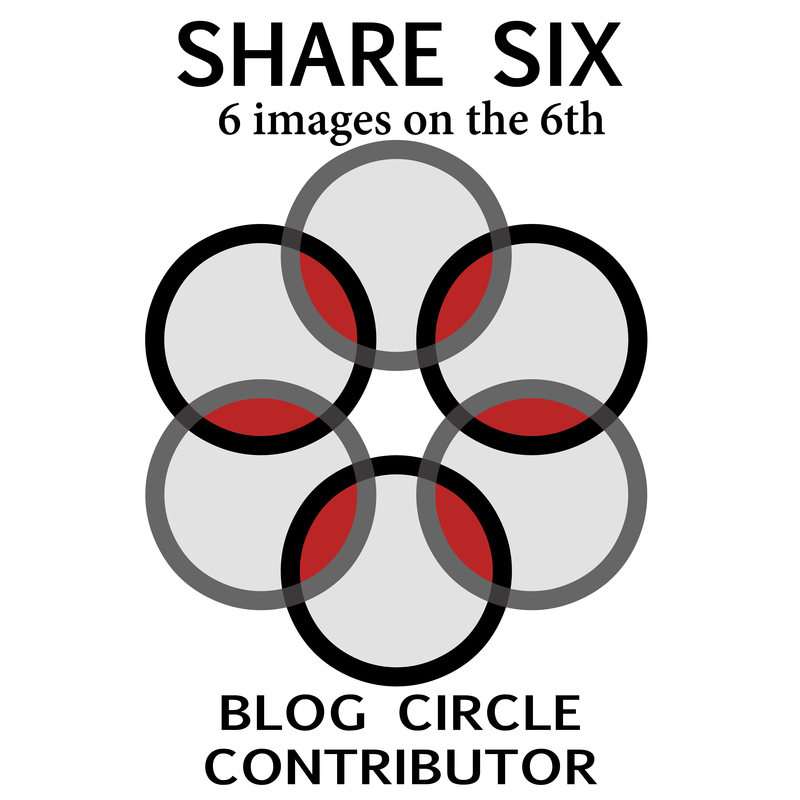 Please remember that this is a circle blog, so take time to read what the other photographers have for you. Up next is Sharon Meyer Photography. 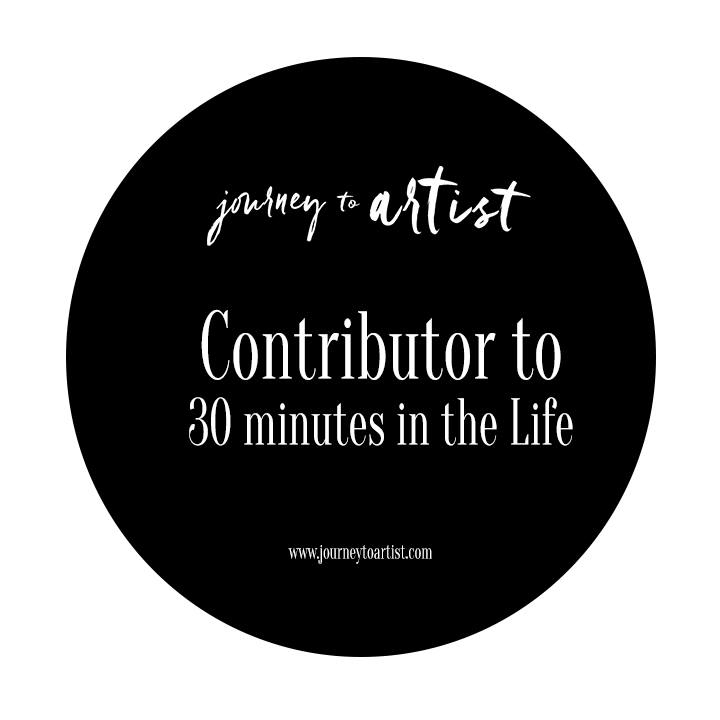 Take some time to check out her blog and then follow the circle link and leave some encouragement on the other photographers pages.